This article contains facts and information about the life and times of the famous Native American Indian leader known as Sequoyah. Who was Sequoyah and why was this Native Indian leader famous? Summary: Sequoyah (c. 1765-1843) a Cherokee Native American who created an alphabet of 86 syllables for the Cherokee language in the early 19th century. Sequoyah is the only person known to have invented a whole alphabet, which he used to record the history of his tribe. The Cherokee Native Indians used the alphabet to communicate in writing, Sequoyah had a Cherokee mother and European father. The sequoia giant redwood trees of California are named after him. The following fact sheet contains interesting facts, background history and information about the life of Sequoyah and the events in history that led to his fame as a great Native American Indian leader. Sequoyah, also known as George Gist or George Guess, was born around 1770, near Fort Loudon alongside the Tennessee River. His mother, Wut-teh, was a member of the Cherokee tribe, the daughter of a Cherokee chief. His father was believed to be German, by the name of Nathaniel Gist. Sequoyah was raised in the Cherokee tribe by his mother who ran a trading post. Although he did not speak English he became fascinated by the white man's ability to write and their "talking leaves" (printed pages). He was amazed that this method of communication enabled the transmition of information over great distances. He was also greatly impressed with the ability to record history and accumulate knowledge from the printed word. 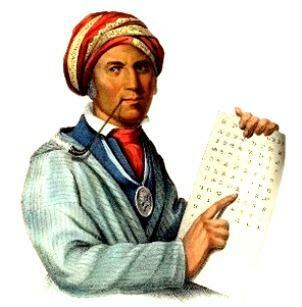 Sequoyah became determined to produce a writing system that could be used by the Cherokees and started to experiment with an alphabet for the Cherokee language. Sequoyah was a hunter and fur-trader and along with other Cherokee Native Indians he served as a soldier under Andrew Jackson during the Creek War (1813 - 1814). He realized during the war that, unlike the white troops, Cherokee Indians were not able to write to their loved ones and could not understand instructions which were given to them in paper. Most importantly, they were not able to write their name. He returned home from the war and then had an accident that made active work difficult. He became a craftsman particularly adept at making silver ornaments that were sold at the Trading Post. He also returned to developing the Cherokee alphabet and writing system. Sequoyah eventually devised eighty-six written characters, each representing one of the syllables of the tribe's spoken language. He lived a peaceful life with his wife, named Sally, from the Bird Clan. His family were instrumental in the spread of his Cherokee writing system. He first taught it to his brother and then to his daughter, A-Yo-Ka. Sequoyah started to teach his people to write and the syllabary proved to be easy to learn. The tribal council approved his work and in 1827 the leaders of the Cherokee tribe ordered printing types cast of Sequoyah's alphabet and purchased a printing press. On February 21, 1828, the first issue of the Cherokee Phoenix was published. In 1828, Sequoyah journeyed to Washington, D.C., as part of a Cherokee delegation to negotiate a treaty for land in the planned Indian Territory. US government officials presented him with an award, and Charles Bird King painted his portrait. In 1829, Sequoyah moved to a location near the present city of Sallisaw, Oklahoma, where he built his home referred to as Sequoyah's Cabin. Sequoyah met representatives of other Native American tribes and attempted to create a universal syllabary that could be used by all tribes. The system for writing with Symbols for letters is called a syllabary. A syllabary is an alphabet in which each symbol stands for a syllable. Syllables are built up of consonants, each of which has a built in vowel, e.g. ka, kha, ga, gha. Other Native American Indian tribes such as the Blackfoot, Cree and Ojibwa also developed Syllabic alphabets, use symbols for letters. The Blackfoot and Cree syllabary was devised by an Anglican missionary called John William Tims (1857-1945). The Ojibwa syllabary was devised by a Wesleyan missionary named James Evans. Refer to the Cherokee Syllabary for an example of Sequoyah's Cherokee alphabet. The last years of this intelligent, gentle man were spent searching for the "lost" Cherokees, a group who had migrated to Mexico. In 1843 Sequoyah died from natural causes near Matamoras. The brilliance of Sequoyah has been recognized in many memorials. A national park and the giant redwood trees of California were given his name. A statue of Sequoyah can be seen in the national capitol. Discover the vast selection of pictures on the subject of the tribes of Famous Native Americans such as Sequoyah. The pictures show the clothing, war paint, weapons and decorations of various Native Indian tribes, such as the Cherokee tribe of Sequoyah, that can be used as a really useful educational resource for kids and children of all ages studying famous Native Americans such as Sequoyah. We hope you enjoy watching the video - just click and play - a great educational resource for kids.